1. Contestants are required to answer a skill-testing question on information revealed in one of Doug Simpson’s published books. 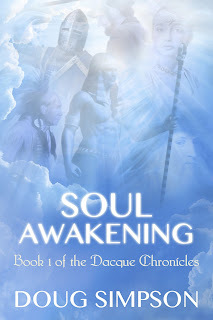 If you have read Soul Awakening, Book I of the Dacque Chronicles, or can locate the answer elsewhere, identify the alias or group name used by Fred Winston in his dealings with The Reincarnation Enlightenment Group. If you have read Soul Rescue, Book II of the Dacque Chronicles, or can locate the answer elsewhere, identify the alias or group name used by Daphne Jones in her dealings with The Reincarnation Enlightenment Group. If you have read Soul Mind, Book III of the Dacque Chronicles, or can locate the information elsewhere, identify the alias or group name used by Detective Don Jensen in his dealings with The Reincarnation Enlightenment Group. 2. Contestants are required to send an email to the author at jesuscayce@yahoo.com dated no later than February 22, 2013, with “5PP Contest – Answer” in the subject box, and in the email supply your answer and identify which book it was revealed in. Contestants may submit one entry in February for EACH book. Employees and authors at 5 Prince Publishing are not eligible to participate in this promotion. 3. On February 23, 2013, the names of all eligible contestants will be entered in a draw and the winner selected at random. The winner will be notified by email on or about February 23, 2013, and identified on the author’s blog at http://doug-simpson-author.blogspot.com/ in early March. The gift card will be sent directly to the winner by the publisher, 5 Prince Publishing. Visit 5 Prince Publishing at http://www.5princebooks.com/buy.htm and check out all of their authors and their publications. Many 5 Prince Publishing authors will be running somewhat similar promotions. The publisher, 5 Prince Publishing intends to run monthly contests after February but reserves the right to terminate these promotions at its discretion.